Of all the hotels in Monterey, CA, Ramada Monterey is perfect place to stay during your trip to visit a loved one at the Defense Language Institute or Naval Postgraduate School. Within three miles of the Monterey airport, it is convenient for attending graduations, military ceremonies or the celebrations of Language Day. 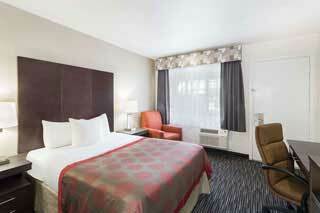 After a long day exploring, spend the night at Ramada Monterey. Located within three miles of downtown Monterey, the beaches and the airport, Ramada Monterey offers its guests the most value. With a heated pool and free parking, you’ll be able to relax during your holiday. The added amenities of a mini-fridge and microwave in your room and deluxe continental breakfast featuring fresh waffles will truly make you feel at home. And with complimentary high speed Internet access, it’ll be easy to plan your next day. Make an Online Reservation Today. 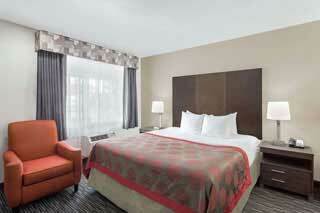 We look forward to having you as our guest at Ramada Monterey. 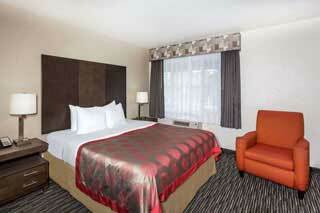 For the most affordable of all the expensive and cheap hotels in Monterey, CA, Ramada is beyond compare. Make an Online Reservation Today. We look forward to having you as our guest. These pleasant rooms are perfect for couples on a romantic getaway, business travelers, or those who just want to have some relaxing time alone in luxury. Ramada Monterey provides the best Monterey CA lodging as the hotel is ideally located near the most scenic and exciting attractions the area has to offer. From the picturesque 17 Mile Drive to the charming shops and historic adobes of Cannery Row, there is plenty to see during your vacation. If the reason for your stay is more business than pleasure, the hotel is also close to the Naval Postgraduate School and the Defense Language Institute. Monterey has all of the sights and sounds California is known for. After spending the night in Monterey Bay Aquarium lodging, take a trip to Fisherman’s Wharf and iconic Cannery Row, made famous by Nobel Prize winning author John Steinbeck. You can enjoy the breathtaking coastline at Pebble Beach or Point Lobos. If fine art and music suit your tastes, the Monterey County Fairgrounds often host music and art festivals throughout the year. Pebble Beach is a great place to take in the sights, or you can play 18 holes at the golf courses. Take the car out for a spin down the 17 Mile Drive and prepare to be amazed by the dramatic coastline. Kayaking, surfing, biking and hiking are all popular activities at nearby Carmel beaches, Big Sur or Point Lobos State Reserve. Experience the thrills of sports racecar driving at Laguna Seca Raceway. There is so much to experience in Monterey, from whale-watching to kayaking to a leisurely stroll down Cannery Row. A perfect afternoon can consist of exploring the history of the area and browsing interesting shops while enjoying a beautiful view of the waterfront. After your walk, grab a bite to eat at Old Fisherman’s Wharf, known for its fresh seafood. If you’re looking to experience some nature first-hand, take a trip on a whale-watching boat…you never know what you might see!